Carrier Rental Xpress asked us to develop a system that would allow their tele-sales team to capture their client's requirements and generate a quotation based on the information collected. The primary outcome was the ability to create quotations quickly and efficiently so that they could be sent directly to the prospect. 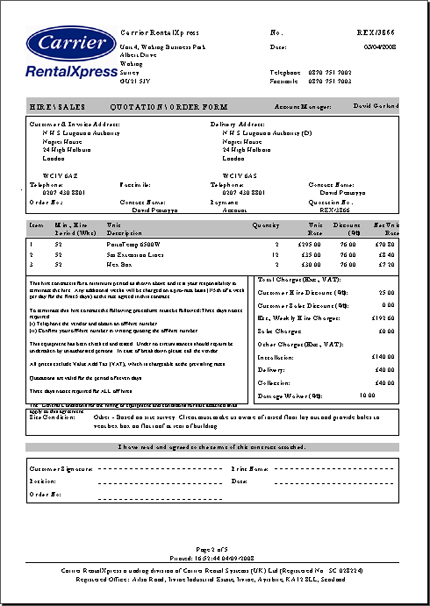 Ayrmer Software developed a system called "HireMe" that replicated a well established business process for calculating quotations that took into account a number of issues relating to the hire of equipment including "damage waiver", "installation charges" and "on / off hire".